Our oldest son is turning 10 tomorrow, so I asked him what treat he wanted to share with his classmates. He asked for chocolate chip cookies (no surprise there! 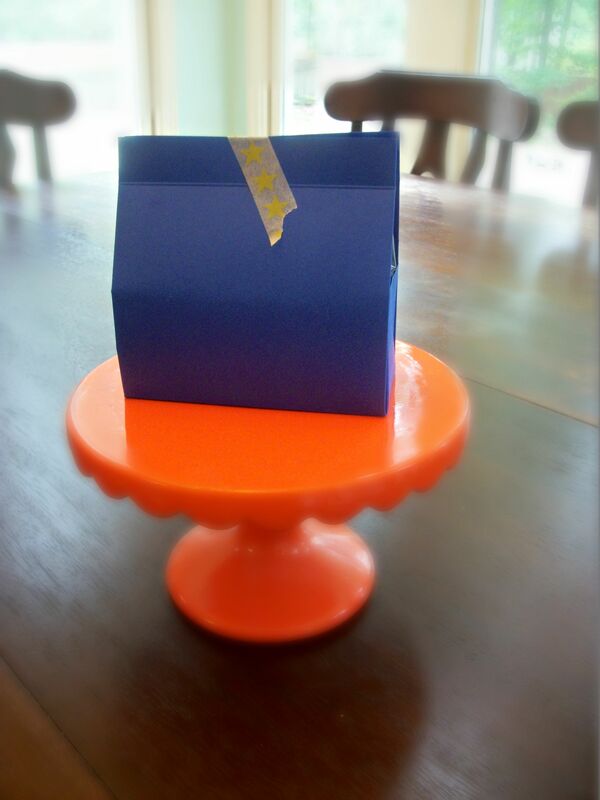 ), and so when the mood struck me to make something, I decided to make a cute little container for the cookies. Now, will the kids in his class care about this package? No. Will my son care about this package? Probably not. I did it because I need a creative outlet, and there are just so many ideas for adorable packaging out there! I read comments occasionally along the lines of “who has time for that?,” and I’ll answer that we all need to take time to do things that we find fun and enjoyable! This is just a variation on the box that I used for the mini banana bread packaging. You can read about that by clicking here. Start out with a piece of 8 1/2 x 11 inch sheet of cardstock. In the landscape orientation, score it at 3/4 inch, 4 1/2 inches, 6 1/2 inches, and 10 1/4 inches. Rotate the paper to the portrait orientation and score it at 2 inches and 6 1/2 inches. Since I was making a lot of these, I scored all of my papers at once. This took me less than five minutes using my scoring board. With the paper in front of you, place one hand holding the lengthwise fold, putting your index finger right below where the corner of the folds meet. Then, with your other hand, bring the folded paper back on itself while keeping your pointer finger in the corner area to facilitate the diagonal fold. Taping the flaps down is certainly not the most beautiful way to finish these little boxes/bags, but these 4th graders are just going to recycle this bag as soon as they get it, so taping was definitely quicker and easier than gluing down the flaps. For a bridal shower or ladies’ lunch, I would probably go the extra mile and glue it down for a cleaner look. Once both sides are folded and taped, you are almost there! Squeeze it into the correct shape. Pinch the top and close it up with a staple, tape, string, etc. I have a lot of washi tape, so I try to use it whenever I can. I chose these stars because they seemed celebratory! I was trying to figure out how many boxes I have made with this type of folding, and it is literally in the thousands. As you can imagine, I am really fast at making them now. From start to finish, it took me less than 30 minutes to make 26 little boxes. I timed myself, and I can fold and tape one in about 30 seconds. But like I said, I can practically do this in my sleep. If you haven’t done this before, I would plan on 2 minutes per box until you get the hang of it. So now I have 26 little boxes in various shades of blue, and it makes me smile to see them all pretty and lined up! Who knows, maybe even the kids will appreciate them!